“The Lord is here,” intones the vicar at thousands of services of Holy Communion week after week. Except He’s not: His Spirit might be brooding in the chocolate-box parishes of England, but the Lord is actually in Calais; walking the streets with the homeless, feeding the hungry, healing the sick, comforting the destitute and dying. If the Lord were to visit the Vatican, He’d tear down the papal portraits and smash the marble statues, barking something about idols and dens of thieves. If He were to enter Westminster Abbey, He’d refuse point blank to pay a £20.00 admission fee, daring to remonstrate with the Dean about the righteousness of royal peculiars and the hollowness of the dead curating the dead. He’d attend no banquet at Lambeth Palace, nor feast on a state dinner at Windsor Castle. He’d decline invitations from princes to chat about the need for benevolence; and from prime ministers to pore over political policy. He’d prefer instead to meet some of the Kids Company family – not the boss in all her Widow Twankey finery, but the kids, who have been stripped of care and ousted from their homes of fellowship. He might descend on an inner-city church; not to mount the pulpit and deliver a tea-and-biscuit sermon, but to serve hot soup and help pick up the detritus of drug abuse from the urine-drenched rags in the graveyard. He’d listen to tales of loneliness and misery, and then fall asleep in the porch with the stinking down-and-outs, shivering in a sack as the bitter night freezes upon Him. This is the Church of Jesus Christ. It is for the poor, the weak, the lonely, dispossessed, hurting, grieving and broken. It is for the desperate and oppressed; the destitute and dying. Hold your nose and avert your eyes: it is the swarm of humanity in the cesspit of life. You might prefer to sing your songs of praise to private entrepreneurship as you bask in the benefits of economic growth. 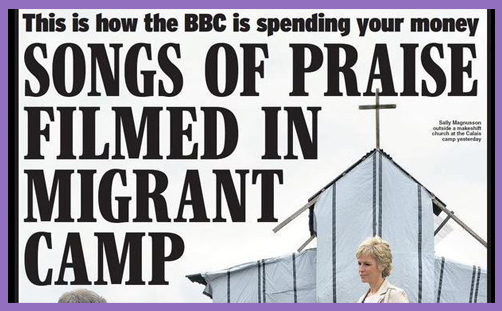 But the Lord sings His songs of praise in the cardboard church of Calais. The Lord is there. His Spirit is with them. Glory to God in the lowest.